KINGSTON - The Senate in Jamaica has approved the Integrity Commission Bill, paving the way for the establishment of a single anti-corruption unit, which will investigate and prosecute corruption in Jamaica. The Bill was piloted in the Senate yesterday by Minister of Foreign Affairs and Foreign Trade and Leader of Government Business in the Senate, Kamina Johnson-Smith. The legislation, which will promote and enhance standards of ethical conduct for Parliamentarians, public officials and other persons, was passed with 103 amendments. It makes provisions for the establishment of an Integrity Commission, which will be responsible for investigating alleged or suspected acts of corruption; preventing, identifying and prosecuting corruption; and monitoring the award and discharge of Government contracts and prescribed licences. The new body will have three Directors heading the information and complaints, investigation and corruption prosecution divisions. Among the amendments is the creation of the post of Executive Director to head the proposed Integrity Commission. This Executive Director will be responsible for the day-to-day management of the affairs of the Commission; coordinating the functions of the Commission; ensuring the timely implementation of the decisions and directions of the Commission; and developing and implementing operational policies and procedures in relation to the functions of the Commission. 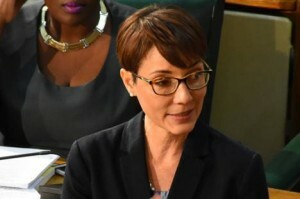 Senator Johnson-Smith explained that the Government felt this lone post was a better arrangement than having Directors of the three divisions of the body report directly to the Commissioners, as was previously stipulated in the Bill. The Integrity Commission is to be formed through the merger of the Commission for the Prevention of Corruption, Integrity Commission and the Office of the Contractor General. The Bill will go back to the House of Representatives for approval of the amendments made by the Senate.